Explore our timber frame plans by home style. We offer many different style homes to meet every taste. Find your timber frame floor plan by your desired square feet! 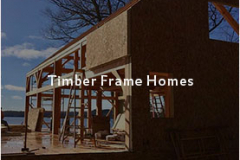 We design and craft timber frame and panelized homes of all sizes. 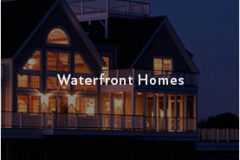 We invite you to look through our sample gallery of custom timber frame homes that we have built over the years. We invite you to check out some of the beautiful Classic Barn Homes that we have built over the years. 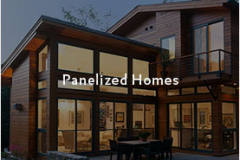 Discover our high quality panelized homes. Our prefab walls speed up construction on-site and drastically minimizes waste. 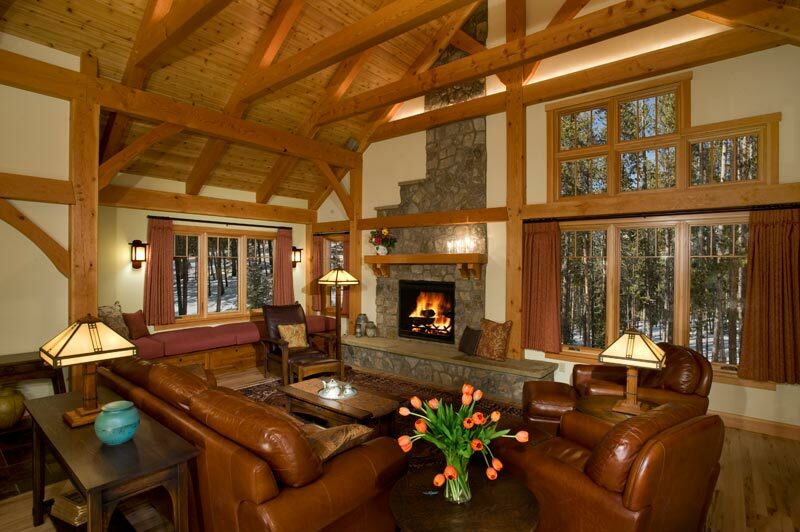 Great rooms serve many purposes in a timber frame home. Most great rooms are large and flow into other main areas of the home like the kitchen and dining room. Timber frame kitchens often flow into the great room and dining area to allow conversation between the guests and the chef. Many timber frame bedrooms and bathrooms capture the beautiful view of the home's surroundings. In the mountains, by the ocean, or in a rural community, timber framing can stylize any exterior that you want in your dream home. Here will see a variety of pictures showing the process of the timber frame raising, the adding of joinery and structural insulated panels, and the finished product. Check out our portfolio of gorgeous timber frame barns and outbuildings. Explore building a hybrid timber frame home! We combine timber frame with conventional stick frame. Not sure where to begin? Learn our process, from design to delivery of your new home package from Davis Frame. Explore our material options for your new home's weather tight shell package. Have a question? Check out our frequently asked questions section where you may find your answer! 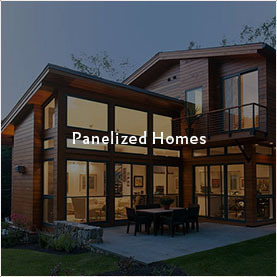 Learn the differences and benefits on building a panelized home vs. traditional on site stick frame construction. Discover the beauty of barn home living with our line of Classic Barn Homes. 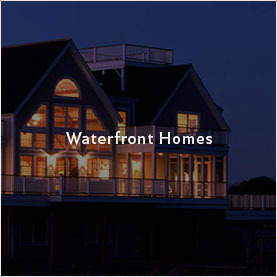 Inspired by the beauty and tradition of barns, homesteads, seashore cottages, farmhouses, and colonial homes of days gone by, we’ve designed more than 25 standard timber frame models to suit every lifestyle and budget. We offer complete in-house design services to suit your land, lifestyle and budget. Depending on your requirements, we can either modify one of our pre-designed timber frame plans or design a custom home from scratch. We service the entire USA and have cutting facilities on both the East and West Coast. Learn more today! Discover what our clients have to say about working with Davis Frame! We welcome you to come visit us in Claremont, NH! We are happy to provide you with directions. 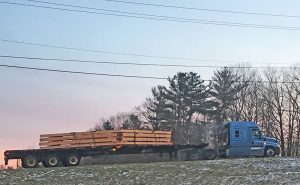 Today’s blog post is a great topic and covers working remotely with Davis Frame on your new timber frame home and was written by our salesman Mike Pollari. Mike has some great insight to offer on working on new timber frame home projects with clients remotely. A couple of recent distant projects he has worked on include Arkansas and Missouri. 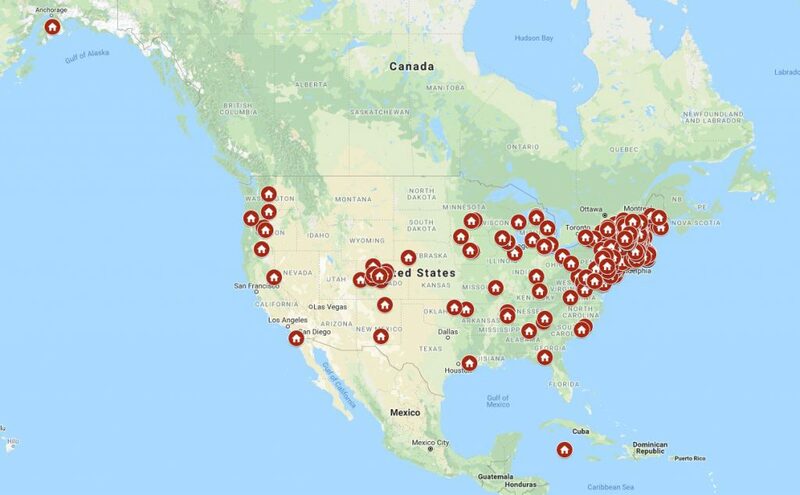 We are no strangers to shipping our timber frames nationwide! One of the benefits of being a company that has been in business as long as Davis Frame Company has is that we can safely say we were one of the early companies to help mainstream the use of timber frame construction into homes throughout the United States. That being said, one of the hardest questions to answer for people is “How do you sell your timber frame package to me when you’re so far away?” I hear this every day from not only potential clients but builders that we work with as well. 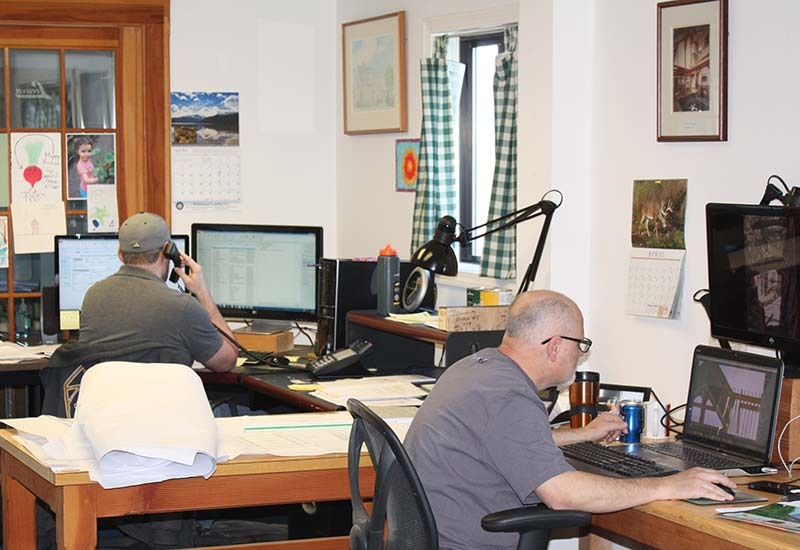 It’s no secret that Davis Frame Company is a small timber frame and panelized company in a rural area of New Hampshire, but we have the ability to use the technology of Google Earth to view your site and also integrate virtual online meetings in our design process to bridge that gap. It’s safe to say when you’re designing your dream house it would be a lot easier to see someone face to face when you’re looking to make decisions, but often many of our clients located within driving distance choose to work with us virtually, as it’s more convenient for their schedules. Our process is pretty much the same for all clients and the whole design process can be achieved remotely. We have been very successful working with clients from all over the U.S., including the Northeast, Mid-West, West Coast and even the island of Grand Cayman. The number one reason clients choose to work with us is that they develop a comfort level with the project manager that they’ve been assigned which makes them feel more comfortable about the process of designing their home. Building a relationship and trust early on is key for our clients. Now onto the overall design process. Our clients come to us looking for the “wow factor” of a timber frame and really have no idea how to integrate it into their home and they value the specialized expertise we offer. We start with their floor plan and this is usually the hardest part of the process because it can be hard to visualize the overall space in your home. So many people start the process by being attracted to a square foot number but once they go into the design portion of their home, they realize that efficient space is much more desirable then overall space. Our design team also will give valuable design suggestions that the client may not think of. Once we develop the floor plan, we simplify the exterior of the home with a 3D massing of what the overall shape of the timber frame home looks like, it can sometimes look like a house you’d be buying in Monopoly with no windows, doors or any character. But the idea is simple, do you like the shape? After we get the footprint and a preliminary floor plan is drawn, we work on the exterior architectural details such as siding, exterior trusses in the gable ends, brackets and exposed timbers on porches are all really important features to think about during this stage. Once we have details on what our client would like to see for architectural details, we develop elevations, window schedules and sections that are the most important part of getting your project from paper to the next step. After these preliminary drawings are complete, our clients will ask us “how much is this going to cost?” With the preliminary drawings we’ve worked on we are able to price a timber frame package. From this point, our clients have everything they need to get their construction budget established with their builder and move forward with their new timber frame home! Here’s the glue that holds the project together, do you have a builder picked out? The best part about being involved early in the design process is quite often our ability to make suggestions to clients based upon what we feel will not only help in the overall cost but will also create job site efficiency for the builder, we call this process “value engineering”. Admittedly all the value engineering in the world isn’t going to make a difference if the builder that is selected has never worked with timber frame before, it’s an art form and needs to be treated as such. 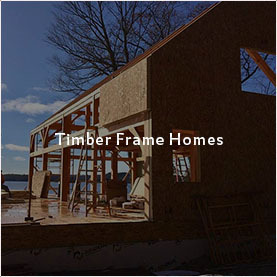 Unlike conventional framing which gets hidden behind sheetrock and other finished material, the point of a timber frame is to display it proudly as you would any furniture in your home, our clients are proud of their timber frame homes and therefore the effort that goes into their installation is equally important. So, what can the builder do? The most important step in ensuring the construction of your timber frame home goes smoothly is getting your builder engaged early in the process. Asking all the right questions and being candid about, “I’ve never done one of these before” can be helpful so that we can help your builder install the timbers and SIPs in a way that is efficient and effective for the client. If in the end the builder isn’t as comfortable with the process and needs a helping hand, we can offer a technical advisor where one of our crew members can help with the install. The other misconception about how we can properly help with a job from our remote location is ensuring that the material gets there when it’s needed and not before. We are often in daily contact with our clients and their builders to keep apprised on scheduling changes or letting them know the location of their package in relation to their site. Having great relationships with both trucking companies that handle our deliveries is the ability to pick up the phone and get in touch with them to handle logistics. With our ability to source windows and doors nationally we can also ensure they not only arrive on the job site on time and when needed but getting them designed into the home from the beginning is key to getting exactly what you want. What Other Hurdles Can There Be? While preparation and proper planning are essential in ensuring the success of your timber frame or panelized home there is always the chance that something can go wrong, knowing that you can pick up the phone and speak to the person that you started the process with all the way back at the design stage should give you some comfort as you embark on your journey to building a new timber frame home. To learn more about working with Davis Frame Company call us today at 800.636.0993! Dreaming of a Timber Frame Barn? Questions or Comments? Leave us a quick note and someone will be in touch with you shortly. Would you like to receive our e-newsletters? Sign up for our e-newsletters and event notifications! Follow us on Social Media for all our updates!